Apple posted a big drop in iPhone sales. Markets check: US markets closed mixed. Stocks to watch: 3M (MMM), PG&E (PCG), Xerox (XRX), Harley-Davidson (HOG), Verizon (VZ) and GameStop (GME). Apple sells a lot of AirPods. Its subscription products are doing great, and people are still buying up Apple Watches. But the company's bread and butter is struggling. CNN Business' Seth Fiegerman explains Apple's (AAPL) new iPhone reality, and gets to the heart of Tuesday's earnings report. This is essentially Apple's new pitch to investors: The iPhone product line, which has long been Apple's core business, may be in decline, but other product categories are growing fast to pick up the slack. For the first time in years, Apple did not disclose the number of iPhones sold. But it did provide more details on the strength of its newer wearables product line as well as its Services category, which includes Apple Pay, Apple Care and Apple Music. The last time Apple's holiday quarter sales fell, America was consumed with Bush v. Gore and Tom Brady had one completed pass in his career. Apple's sales fell 5% in the last three months of 2018 -- and that's the first time Apple's sales dropped during the final quarter of the year since 2000. In the last three months 2000, Apple posted $1 billion in sales, less than the $2.3 billion in revenue it made in the 1999 holiday quarter. (By contrast, Apple's sales totaled $84.3 billion last quarter). In 2000, Apple's biggest product was the Macintosh. But it only sold 659,000 of them in the holiday quarter of 2000 -- down from 1.4 million a year earlier. Apple (AAPL) attributed the loss in sales to "continued deterioration in worldwide demand for personal computers," price cuts and rebate programs to cull inventory. At the time, Apple was selling a lot of its new iMac computers and iBook laptops but still had a ton of Power Macs at stores that it had to get rid of. The company also had introduced the G4 Cube in July 2000, its biggest flop of all time. Apple sold just 29,000 of them during the 2000 holiday quarter and had to sell them at a steep discount to get them out of stores. *An earlier version of this post incorrectly stated Apple's quarterly sales decline. For the first time in years, Apple (AAPL) did not disclose the number of iPhones sold as part of its quarterly earnings report. On a conference call for its last earnings report in November, Apple announced that it would stop disclosing the number of iPhones, iPads and Macs sold each quarter. The move came as a shock to Wall Street. For years, this figure has been a focus among industry watchers -- and it only seemed to go up, up, up. In more recent quarters, however, iPhone shipments have flatlined or even declined. On Tuesday, Apple said iPhone revenue for the quarter fell 5% amid weakness in China. (See correction, below.) The figure suggests a decline in the number of iPhones sold. Unlike other quarters, however, Apple won't say exactly how much. Correction: An earlier version of this post incorrectly stated Apple's quarterly sales decline. 1. Foreign exchange rates. Cook says the strength of the US dollar has hurt sales around the world. 2. Fewer subsides. iPhone subsidies are becoming less common around the world. Here's a quick glance at Apple's revenue last quarter, courtesy of Neil Cybart, an analyst who follows Apple closely. As iPhone sales continue to fall, Apple (AAPL) hopes that its services business can eventually more than make up the difference. Although we're a long way from that happening, Apple services had a very nice quarter. Revenue from the app store, Apple Music, Apple Care and other subscriptions rose 19% to a record $10.9 billion. That's far less than the $52 billion Apple brought in from iPhone sales. But unlike the iPhone, it's growing -- strong. Apple delivered solid growth from its wearables, home and accessories business too. Sales grew 33% from that business unit, which includes the Apple Watch, AirPods and HomePod. After resetting Wall Street's expectations about last quarter, Apple (AAPL) had to level with Wall Street once more Tuesday: It's not too optimistic about the current quarter either. Apple said it expects sales to come in between $55 billion and $59 billion this quarter, below analysts' median estimate of $59 billion, according to a survey of Apple analysts conducted by Refinitiv. The company's profit will be pinched too. Apple expects its gross margin to come in between 37% and 38%, below Wall Street's expectation of 38.1%. That's also below the 38.3% gross margin Apple earned a year ago. Investors weren't overly concerned, perhaps because the guidance wasn't quite as bad as some had feared: The stock was up 3% in after hours trading. 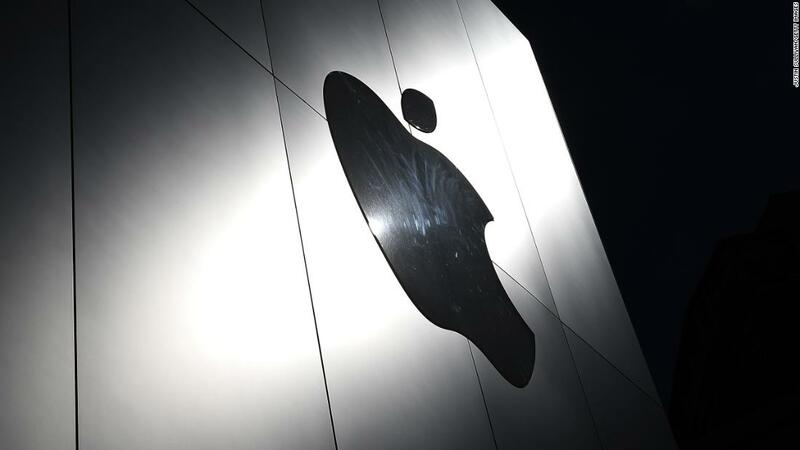 Apple's (AAPL) first quarter 2019 earnings results, by the numbers: Apple said Tuesday that its sales for the all-important holiday quarter hit $84.3 billion. The figure was slightly better than Apple had warned investors to expect earlier this month, but nonetheless represented a 5% decline from the same quarter a year ago. The sales decline was driven by a dip in iPhone sales, which Apple CEO Tim Cook previously said was primarily due to a slowdown in China. Apple's iPhone revenue for the quarter fell 15%, to $51.98 billion. Apple's sales in China also fell considerably. It reported revenue in the region of $13.17 billion, down from $17.95 billion in the same period a year ago. Apple stock initially rose as much as 3% in after hours trading Tuesday following the report. The last time Apple reported earnings results, it was the most valuable public company in the world. Today, it’s fourth on the list. Apple (AAPL) stock is down about 30% since the last time it reported earnings in early November. Investors are worried about the future of the company’s core business: the iPhone. On a conference call with analysts for the last earnings report, Apple announced it would stop reporting how many iPhones, iPads and Macs it sells each quarter. The move sparked fears that Apple expects iPhone shipments to begin declining. Less than two weeks later, iPhone parts suppliers began cutting sales outlooks, which raised more alarms. Then came the biggest red flag of all. On Jan. 2, Apple CEO issued a stark warning to investors that the company would miss its revenue target for the final quarter of 2018 by a wide margin – as much as $9 billion below the high end of its earlier guidance. The reason: weak iPhone sales, primarily in China.